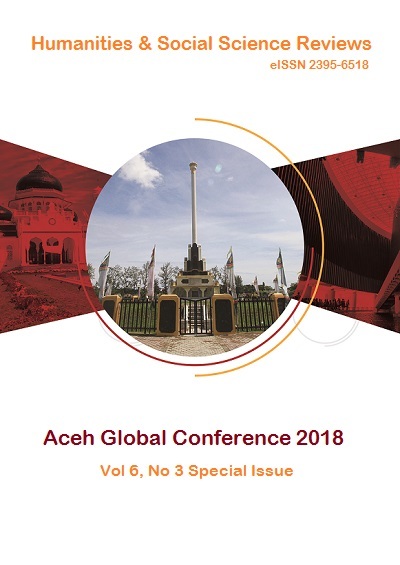 ANALYSING THE USE AND DESIGN OF GEOMORPHOLOGY MULTIMEDIAIN GEOGRAPHY EDUCATION DEPARTMENTIN IN UNIVERSITIES OF ACEH PROVINCE | Humanities & Social Sciences Reviews Articles invited for Vol 7, No 2 issue. Upload before 30th May 2019 in Make a Submission tab. Purpose of the study:The objective of the study was to analysethe use of multimedia by lectures at Geography Education Department in Aceh. Methodology:The subject of this study was a lecturer teaching geomorphology, while the object was the use of multimedia and its design. Data collection was carried out through qualitative and quantitative approaches using multimedia documentation and geomorphological multimedia designs. Data processing is done by analysing multimedia usage and design in learning geomorphology. Main Findings:The results of the analysis show that geomorphological learning multimedia is used in the form of dictates, power points, and the internet which presents one unit of landform. There are no integrated multimedia and multimedia results from their own. Field practice equipment is available in the form of plywood, fabric meter, bow, loop, GPS, and hammer. Applications of this study:This study provide information tolecturers at Geography Education Department in Aceh in teaching. Novelty:Few lectures are interested in incorporating multimedia in their teaching even though it is the best media for learning geomorphology. 1. Achmad. (2013). Benefits of Learning Media. http://achmadzuhrihs. wordpress.com/2013/05/11/function-and- benefits- media-learning. html (22 April 2014). 2. Alen. (2017) Analysis of the Relationship Between Media and Learning Objectives, https://civitas.uns.ac.id/yuliaputriwardani/2017/05/03/analysis-relationship-between-media-with-goal-learning- according to-allen/. 3. Elizabeth, A. W., Joann, C. V. & Cynthia, A. B. (1999). Evaluation of Teaching Product Geomorphology using Computer-based Tools, Journal of Geography in Higher Education, 23 (2), 167-179, DOI: 0.1080 / 03098269985443. 4. Falahudin, I. (2014). Utilization of Media in Learning. Journal of Circle Widyaiswara, Ed. 1 (4) 104-117. ISSN: 2355-4118. Jakarta. Religious Training Center (BDK). 5. Faniran, A. JejeL.K. (1983). Humid Tropical Geomorphology. London, Logman. ISBN 0582643465. DOI: https://doi.org/10.1017/S0016756800030089. 6. Fuller I. C., France, D. (2016). Does Digital Video Learning Student Learning in the Field Based Experiments and Develop Beyond the Classroom Graduate Attributes. Journal of Geography in Higher Education, 40 (Iss. 2) 193-206.DOI / 10.1080 / 03098265.2016.1141186. 7. Haryono, E. (2003). Basic Geomorphology Teaching Materials Yogyakarta. Basic Geomorphology Laboratory, Faculty of Geography, GadjahMada University. 8. Hofstetter, F.T. (2001). Multimedia: Third Ed. New York McGraw Hill International. 9. Hugget, R.J. (2007). Fundamentals of Geomorphology. Sec. Ed. Abingdon Oxon, Routledge Fundamentals of Physical Geography. 10. Jan, D. H., Dermot, B. H., &Agnes, M. (2013). Theorical Review, What is learning? On the nature and merits of a functional definition of learning. Psychological Society, Inc. Belgium.PsychonBull.Rev DOI: 10.3758 / s13423-013-0386-3 (www.liplab.ugent.be/pdf/learning). 11. Karim, Y. (2014). Student Perceptions of the Use of Learning Media in Geography Subjects in High Schools in BolaangMongondow Selatan Regency. Journal of State University of Gorontalo. 12. Lobeck, A.K. (1989). Geomorphology, New York. Columbia University. 13. Mangwiro, N. (2016). An analysis of teaching media usage in physical geography at Jiti High School in Shamva District. Research results. Samsva. 14. Nandi. (2006). The use of interactive multimedia in learning geography in schooling. GEA Journal of Geography Department, 6 (1). 15. National Education Standards Agency. (2007). Minister of National Education Regulation of the Republic of Indonesia Number 41 concerning Process Standards for Primary and Secondary Education Units. Jakarta. Ministry of Education. 16. Nelson, S.A. (2016). Volcanic Landform, Volcanoes and Plate Tectonics. EENS 3050. 1-12. New Orleans. L.A. Tulane University. 17. Ningrum, M.V.R. (2012). Development of Multimedia Learning Geography Based on Character Education. Yogyakarta. Social Studies Post Graduate Program. S2 thesis, Yogyakarta State University, Yogyakarta. 18. Purwita, N. P. (2012). Multimedia Development in Geography Subjects in High School Class X Semester II for Hydrosphere Topics. Thesis. Poor. Department of Geography Education, Postgraduate Program, State University of Malang. 19. Summerfield, M.A. (1991). Global geomorphology: An introduction to the study of landforms. New York: Longman Scientific & Technical. 20. Vaughan, T. (2011). Multimedia: Making It Work, Eighth Ed. New York: MC Graw Hill. 21. Verstappen, H.T. (1983). Applied Geomorphology: Geomorphological Surveys for Environmental Development on Amazon. English.Publisher: Elsevier Science Ltd. ISBN-10: 0444421815.DOI: 10.1080 / 01431168408948866.